Congressman Steny H. Hoyer (Md.-5th) and other members of Congress sent a letter to congressional leadership urging them to reject President Trump’s plan to cancel scheduled pay raises for federal employees. Those joining Congressman Hoyer in signing the letter were Congressman Gerald E. Connolly (Va.-11th), Congresswoman Eleanor Holmes Norton (D.C.-AL), Congressman John Sarbanes (Md.-3rd), Congressman Don Beyer (Va.-8th), Congressman John Delaney (Md.-6th), Congressman Anthony G. Brown (Md.-4th), and Congressman Jamie Raskin (Md.-8th). 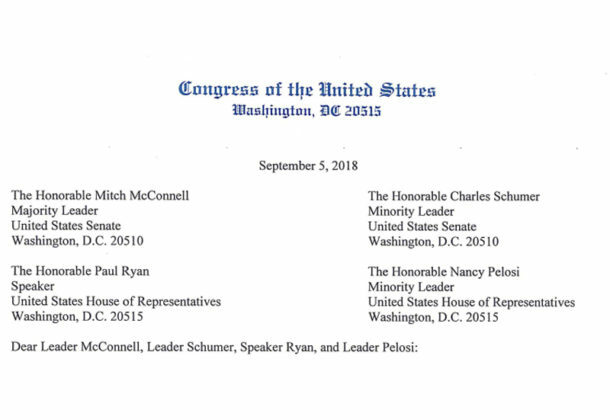 “We request that Congress provide, at the very least, a 1.9 percent federal pay adjustment, which was included in the Senate-passed Financial Services and General Government Appropriations Bill for Fiscal Year 2019,” the members stated in their Sept. 5 letter. The 2.1 percent pay increase for federal employees was scheduled to take effect in January 2019. However, President Trump sent a letter to congressional leadership stating that he had determined that for 2019, both across‑the‑board pay increases and locality pay increases would be set at zero. For more information about House Democratic Whip Steny H. Hoyer, visit his Leader member page.